ldap2pg is a simple yet powerful tool to manage Postgres roles and privileges statically or from LDAP directories, including OpenLDAP and Active Directory. Creates, alter and drops PostgreSQL roles from LDAP queries. Creates static roles from YAML to complete LDAP entries. Manage role members (alias groups). Grant or revoke privileges statically or from LDAP entries. Logs LDAP queries as ldapsearch commands. Reads settings from an expressive YAML config file. Now you must configure Postgres and LDAP connections, then synchronisation map in ldap2pg.yml. 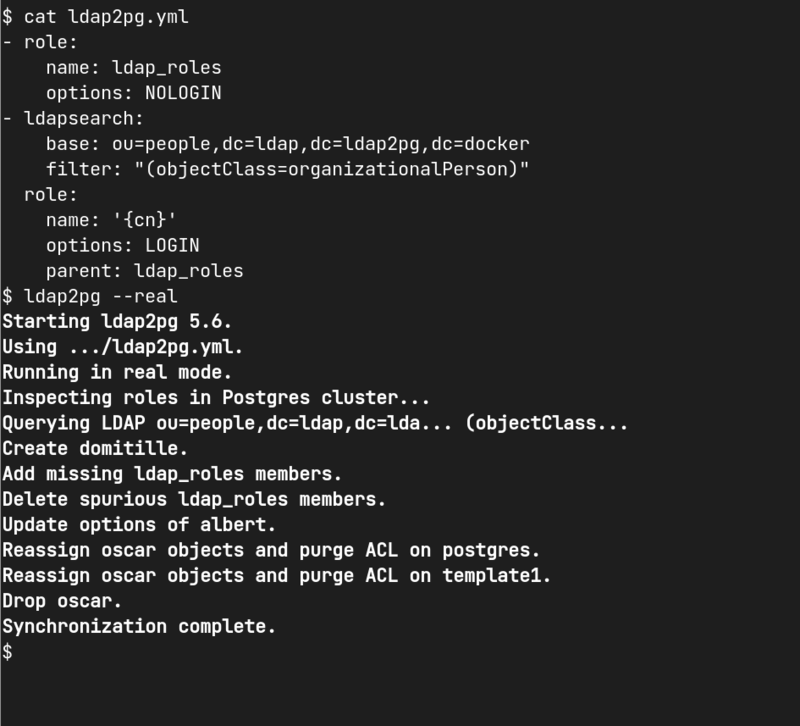 The dumb but tested ldap2pg.yml is a good way to start. Finally, it’s up to you to use ldap2pg in a crontab or a playbook. Have fun! If you need support for ldap2pg, just drop an issue on GitHub!